See More CCTV Software Items Here Active WebCam Simply The Best Software for any type of Camera, works with wireless, wired and network IP cameras alike. Get more functionality from your camera by using features such as Lens Pan,Tilt & Zoom, Live Recording & Selective Motion Detection. Monitor as many cameras as you want in true DVR multi-camera split-screen format, record live camera images direct to your hard disk, use the built in audio and alert functions as well as the comprehensive remote access features for Internet access. 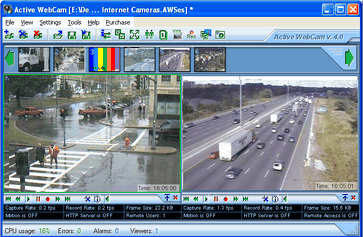 We Recommend Active WebCam Deluxe Software for Full Surveillance capabilities, turn your PC or laptop into a fully functional home/office surveillance server with the ability to access remotely via the internet using the built in web server or another copy of the software running on the remote PC(s).